The first two are fairly cut and dry. I highly recommend parents drive the route from home to school and work to school during their typical commute time. The last thing you want to do is get your child settled into the best preschool just to discover that the commute is awful. Tuition fees can vary depending on the area and level of services provided. It’s an industry standard for most preschools to increase tuition annually by 2-4% to maintain quality care and meet staffing needs. This is typically balanced out by the fact tuition generally decreases as your child gets older. Ask about all the fees up front and make sure you feel comfortable with meeting those obligations annually. The highest tuition doesn’t always mean it’s the best preschool. The second half of this list is much more subjective. One person’s idea of quality care is not the same as another. The easiest way to assess the quality of care is to schedule a tour. Meet the office staff, walk around the school, and ask about things that matter to you. A pro-tip is to do your homework before your tour. Read through a schools website, look up their licensing history, and do a basic google search. Write down any questions those raise for you and bring them with you. Also consider longevity for your family when looking at quality of care. If you are currently needing infant care, make sure to also ask questions about the toddler and prekindergarten programs. Right in line with that is the curriculum. Be realistic with your expectations. While everyone wants to raise the next little Einstein we also want to make sure school is a fun and engaging environment. Ask questions to understand the schools philosophy on learning and decide if you think it will be a good fit for your child’s personality. The last thing I want to touch on is the environment of the school. Nobody knows your child like you do. You know if they thrive in a smaller environment and feel freer to be themselves with just a handful of kids around. Or maybe your child is outgoing and seems to make a handful of friends in every new environment; a large classroom with social opportunities might suit them better. Other environmental things to consider is the age of the teachers, mix of indoor and outdoor time, and general school day schedule. 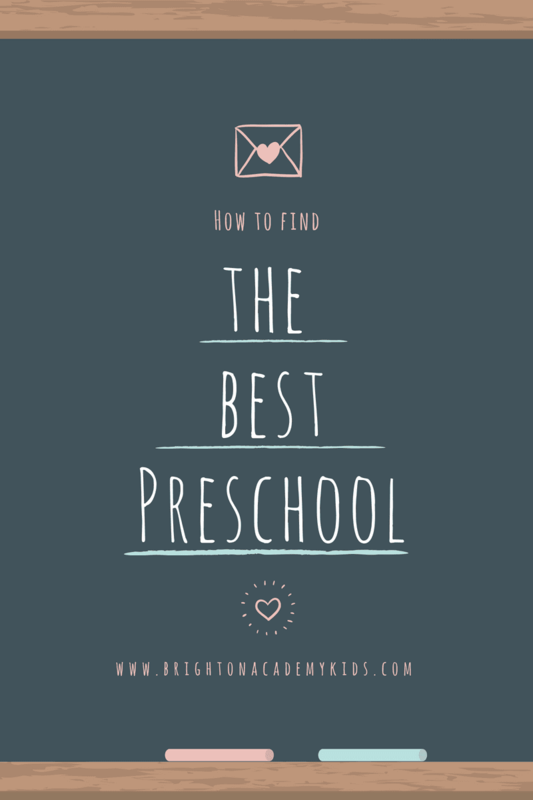 The only way to establish what is truly the best preschool for your child is to see the school in action and imagine your child in that setting. Visit more than one school to ensure you have a comparison to base your decision on. The best preschool really is the one you enroll in. From a personal point of view I can tell you that here at Brighton we take it as a compliment and honor every time a family enrolls with us.